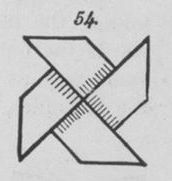 This page attempts to record what is known about the history of Froebelian Folds of Life developed from the Double Blintz basic form and the Windmill Base, which share the same crease pattern. Please contact me if you know any of this information is incorrect or if you have any other information that should be added. Thank you. The history of two of these designs, the Salt Cellar and the Pepperpot, can be found on a separate page. This design first appears, as 'The King's Crown' in part two of 'The Kindergarten Guide' by Maria Kraus Boelte and John Kraus, which was probably first published in 1882 by E. Steiger and Company in New York. The Bed is developed from the Crown and first appears in Lois Bates' 'Kindergarten Guide', which was first published by Longmans, Green and Co in London in 1897. A slightly different version of the Bed appears in 'Die Frobelschen Beschaftigungen: Das Falten' by Marie Muller-Wunderlich, which was published by Friedrich Brandstetter in Leipzig in 1900. The Cradle is developed from the Crown and first appears in Lois Bates' 'Kindergarten Guide', which was first published by Longmans, Green and Co in London in 1897. The Trough is developed from the Crown and first appears in Lois Bates' 'Kindergarten Guide', which was first published by Longmans, Green and Co in London in 1897. This variation of the Crown first appears in part two of 'The Kindergarten Guide' by Maria Kraus Boelte and John Kraus, which was probably first published in 1882 by E. Steiger and Company in New York. 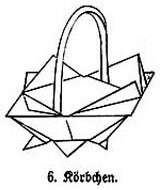 As far as I know this design first occurs in the historical record, under the name 'Le sac de voyage' in a list of paperfolds suitable for use in kindergartens, on the Froebelian model, in the book 'Manual Pratique des Jardins d'Enfants de Freidrich Froebel' edited by J-F Jacobs, which was published in Brussels and Paris in 1859. The Travel Bag (Het reistaschje) is illustrated in 'De Kleine Papierwerkers' by Elise Van Calcar which was published by K H Schadd in Amsterdam in 1863. This design (here called the Portmanteau) also appears in part two of 'The Kindergarten Guide' by Maria Kraus Boelte and John Kraus, which was probably first published in 1882 by E. Steiger and Company in New York. The Travel Bag also appears in 'Die Frobelschen Beschaftigungen: Das Falten' by Marie Muller-Wunderlich, which was published by Friedrich Brandstetter in Leipzig in 1900. The Flat Flower (De bloem) is illustrated in 'De Kleine Papierwerkers' by Elise Van Calcar which was published by K H Schadd in Amsterdam in 1863. 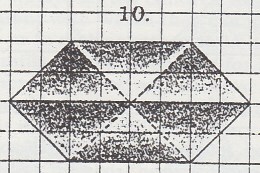 This design, which is developed from the Salt-Cellar, appears in Lois Bates' 'Kindergarten Guide', which was first published by Longmans, Green and Co in London in 1897. The same design appears in part two of 'The Kindergarten Guide' by Maria Kraus Boelte and John Kraus, which was probably first published in 1882 by E. Steiger and Company in New York, as 'The Half Closed Flower'. 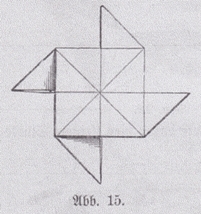 This design, which is developed from the Pepperpot in the same way as the seedpod is developed from the Salt-Cellar, appears in part two of'The Kindergarten Guide' by Maria Kraus Boelte and John Kraus, which was probably first published in 1882 by E. Steiger and Company in New York, as 'The Open Flower'. This design first appears in Lois Bates' 'Kindergarten Guide', which was first published by Longmans, Green and Co in London in 1897. This design is included in 'Die Frobelschen Beschaftigungen: Das Falten' by Marie Muller-Wunderlich, which was published by Friedrich Brandstetter in Leipzig in 1900. 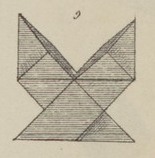 The Kite (Le cerf-volant) appears in a list of designs in the 'Manuel Pratique de Jardins D'Enfants de Friedrich Froebel, which was compiled by J F Jacobs and published in Brussells and Paris in 1859. ... and in part two of'The Kindergarten Guide' by Maria Kraus Boelte and John Kraus, which was published in 1881 by E. Steiger and Company in New York. The Kite also appears in Lois Bates' 'Kindergarten Guide', which was first published by Longmans, Green and Co in London in 1897. There are (at least) two entirely different folded paper windmill designs. To distinguish between them I call them the Cut and Fold Windmill and the Windmill. There is a separate page recording the history of the Cut and Fold Windmill. In his article 'History of Origami in the East and the West before Interfusion', published in 'Origami 5: Fifth International Meeting of Origami, Science, Mathematics and Education', Koshiro Hatori asserts that, ''Many of the European origami models contained in Krause-Boelte's book (ie 'The Kindergarten Guide', published in 1881) are not included in contemporary Japanese records. The pig, house, sofa (also known as piano or organ), balloon (waterbomb), arrow (paper plane), salt cellar (cootie catcher), bird (pajarita or cocotte) and windmill ... were all born in Europe and imported into Japan along with the kindergarten system.' An accompanying illustration shows that this statement refers to the uncut design. 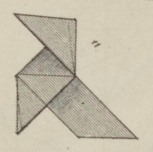 The list of paper folding designs in the 'Manuel Pratique de Jardins D'Enfants de Friedrich Froebel, which was compiled by J F Jacobs and published in Brussells and Paris in 1859, includes a 'moulin à vent'. From its position in the list it can be inferred that this is the Windmill. 'De Kleine Papierwerkers', written by Elise Van Calcar and published by K H Schadd in Amsterdam in 1863, contains a drawing of 'de molen'. 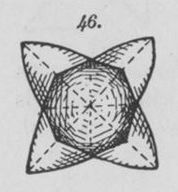 There is mention of a design called 'The Windmill' in 'The Kindergarten Principle' by Mary J Lyschinska, which was published in London in 1880 by Wm Isbister Ltd, but no illustration is given. This design also appears in part two of 'The Kindergarten Guide' by Maria Kraus Boelte and John Kraus, which was probably first published in 1882 by E. Steiger and Company in New York. 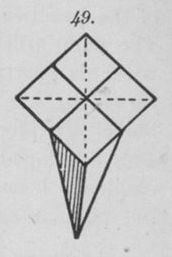 The Windmill is pictured, but not named, in Eleonore Heerwart's 'Course in Paperfolding' was first published in Dutch in 1895 then in English by Charles and Dible in London and Glasgow in 1896. 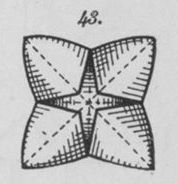 The Windmill also appears in 'Pleasant Work for Busy Fingers' by Maggie Browne, which was published by Cassell and Company in London in 1896. This book is an English version of 'Des Kindes Erste Beschaftigungsbuch'. The Windmill also appears in Lois Bates' 'Kindergarten Guide', which was first published by Longmans, Green and Co in London in 1897. The design also appears in 'Die Frobelschen Beschaftigungen: Das Falten' by Marie Muller-Wunderlich, which was published by Friedrich Brandstetter in Leipzig in 1900. 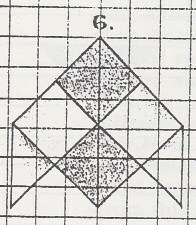 The Table appears in a list of designs in the 'Manuel Pratique de Jardins D'Enfants de Friedrich Froebel, which was compiled by J F Jacobs and published in Brussells and Paris in 1859. The Table also appears in 'Die Frobelschen Beschaftigungen: Das Falten' by Marie Muller-Wunderlich, which was published by Friedrich Brandstetter in Leipzig in 1900. There is mention of a design called 'The Tablecloth' in 'The Kindergarten Principle' by Mary J Lyschinska, which was published in London in 1880 by Wm Isbister Ltd, but no illustration is given. 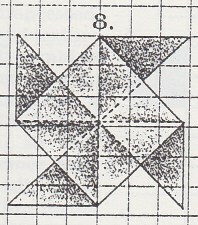 An illustration of the Table Cloth, which is very similar to the table, appears in part two of 'The Kindergarten Guide' by Maria Kraus Boelte and John Kraus, which was probably first published in 1882 by E. Steiger and Company in New York. The Tablecloth also appears in 'Pleasant Work for Busy Fingers' by Maggie Browne, which was published by Cassell and Company in London in 1896. This book is an English version of 'Des Kindes Erste Beschaftigungsbuch'. The Tablecloth also appears in Lois Bates' 'Kindergarten Guide', which was first published by Longmans, Green and Co in London in 1897. This design appears in 'The Kindergarten Guide' by Maria Kraus Boelte and John Kraus, which was probably first published in 1882 by E. Steiger and Company in New York. The Cigar Case (Le portes-cigares) appears in a list of designs in the 'Manuel Pratique de Jardins D'Enfants de Friedrich Froebel, which was compiled by J F Jacobs and published in Brussells and Paris in 1859. 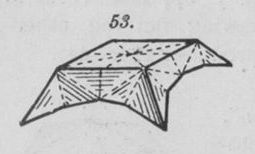 The Cigar Case is pictured, but not named, in Eleonore Heerwart's 'Course in Paperfolding' was first published in Dutch in 1895 then in English by Charles and Dible in London and Glasgow in 1896. 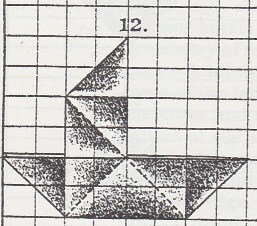 The Boat with Sail (Le vaisseau à voiles) appears in a list of designs in the 'Manuel Pratique de Jardins D'Enfants de Friedrich Froebel, which was compiled by J F Jacobs and published in Brussells and Paris in 1859. ... and in 'The Kindergarten Principle' by Mary J Lyschinska, which was published in London in 1880 by Wm Isbister Ltd, but no illustration is given. 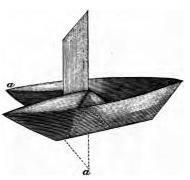 The Boat with Sail is pictured, but not named, in Eleonore Heerwart's 'Course in Paperfolding' was first published in Dutch in 1895 then in English by Charles and Dible in London and Glasgow in 1896. The Boat with Sail also appear in 'Pleasant Work for Busy Fingers' by Maggie Browne, which was published by Cassell and Company in London in 1896. This book is an English version of 'Des Kindes Erste Beschaftigungsbuch'. This design also apperas as 'Le Bateau a Cabine' in Le Livre des Amusettes' by Toto, which was published in Paris by Charles Mendel in 1899. 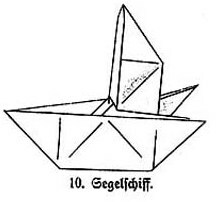 The Boat with Sail also appears in 'Die Frobelschen Beschaftigungen: Das Falten' by Marie Muller-Wunderlich, which was published by Friedrich Brandstetter in Leipzig in 1900. The Vase (Le pot à fleurs) appears in a list of designs in the 'Manuel Pratique de Jardins D'Enfants de Friedrich Froebel, which was compiled by J F Jacobs and published in Brussells and Paris in 1859. There is mention of a design called 'The Flower Vase' in 'The Kindergarten Principle' by Mary J Lyschinska, which was published in London in 1880 by Wm Isbister Ltd, but no illustration is given. 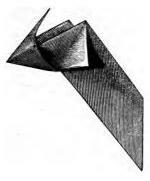 The Vase is pictured, but not named, in Eleonore Heerwart's 'Course in Paperfolding' was first published in Dutch in 1895 then in English by Charles and Dible in London and Glasgow in 1896. The Cravat appears in 'Die Frobelschen Beschaftigungen: Das Falten' by Marie Muller-Wunderlich, which was published by Friedrich Brandstetter in Leipzig in 1900. It is the same design as the Vase but interpreted in a different way. This page only records the history of the Cocotte / Pajarita within the Froebelian tradition. A more detailed account of the history of this design can be found here. 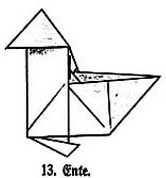 The Cocotte / Pajarita (L'oiseau) appears in a list of designs in the 'Manuel Pratique de Jardins D'Enfants de Friedrich Froebel, which was compiled by J F Jacobs and published in Brussells and Paris in 1859. An illustration can be found in 'De Kleine Papierwerkers', written by Elise Van Calcar and published by K H Schadd in Amsterdam in 1863. There is mention of a design called 'The Bird' in 'The Kindergarten Principle' by Mary J Lyschinska, which was published in London in 1880 by Wm Isbister Ltd, but no illustration is given. I presume this is the Pajarita. This design also appears, as the 'Bird', in part two of 'The Kindergarten Guide' by Maria Kraus Boelte and John Kraus, which was probably first published in 1882 by E. Steiger and Company in New York. The design appears as 'La Cocotte' in 'Le Livre des Amusettes' by Toto, which was published in Paris by Charles Mendel in 1899. This design first appears in part two of 'The Kindergarten Guide' by Maria Kraus Boelte and John Kraus, which was probably first published in 1882 by E. Steiger and Company in New York. It is made by folding the front feet of the Pajarita away inside the design. The Duck is pictured, but not named, in Eleonore Heerwart's 'Course in Paperfolding' was first published in Dutch in 1895 then in English by Charles and Dible in London and Glasgow in 1896. From the context this instance of the Duck was probably folded from a blintzed windmill base. The Duck also appears in Lois Bates' 'Kindergarten Guide', which was first published by Longmans, Green and Co in London in 1897. A slightly more advanced version of the Duck appears in 'Die Frobelschen Beschaftigungen: Das Falten' by Marie Muller-Wunderlich, which was published by Friedrich Brandstetter in Leipzig in 1900. A design called the Bat occurs in 'The Kindergarten Principle' by Mary J Lyschinska, which was published in London in 1880 by Wm Isbister Ltd. I am not sure if there is any connection between these two designs. 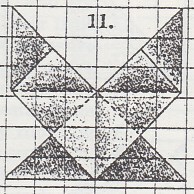 A second design of the same name, which appears to have little connection to the first in terms of its design, appears in part two of 'The Kindergarten Guide' by Maria Kraus Boelte and John Kraus, which was probably first published in 1882 by E. Steiger and Company in New York. 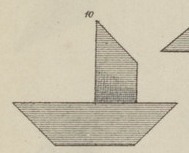 The Double Boat (Le double bateau) appears in a list of designs in the 'Manuel Pratique de Jardins D'Enfants de Friedrich Froebel, which was compiled by J F Jacobs and published in Brussells and Paris in 1859. 'The Kindergarten Principle' by Mary J Lyschinska, which was published in London in 1880 by Wm Isbister Ltd.
Part two of 'The Kindergarten Guide' by Maria Kraus Boelte and John Kraus, which was probably first published in 1882 by E. Steiger and Company in New York. 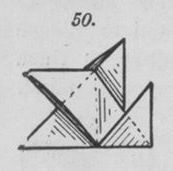 Eleonore Heerwart's 'Course in Paperfolding' was first published in Dutch in 1895 then in English by Charles and Dible in London and Glasgow in 1896. Lois Bates' 'Kindergarten Guide', which was first published by Longmans, Green and Co in London in 1897. 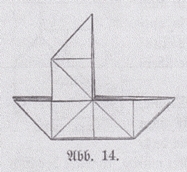 The Boat with Fishbox (La barque du pécheur), which is developed from the Double Boat, appears in a list of designs in the 'Manuel Pratique de Jardins D'Enfants de Friedrich Froebel, which was compiled by J F Jacobs and published in Brussells and Paris in 1859. 'The Kindergarten Principle' by Mary J Lyschinska, which was published in London in 1880 by Wm Isbister Ltd, There is mention of a design called 'The Boat With a Box for Fish' in this book but no illustration is given. 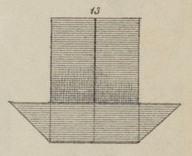 The Portfolio, which is developed from the Boat with Fishbox, appears as 'Le double réservoir pour les poissons' or 'double tanks for fish' in a list of designs in the 'Manuel Pratique de Jardins D'Enfants de Friedrich Froebel, which was compiled by J F Jacobs and published in Brussells and Paris in 1859. 'The Kindergarten Principle' by Mary J Lyschinska, which was published in London in 1880 by Wm Isbister Ltd, mentions a design called 'The Purse' which is most probably the Portfolio, although no illustration is given. Part two of 'The Kindergarten Guide' by Maria Kraus Boelte and John Kraus, which was probably first published in 1882 by E. Steiger and Company in New York, as 'The Double Fishbox or Pair of Panniers for a Donkey'. 'Le Livre des Amusettes', by Toto which was published in Paris by Charles Mendel in 1899. 'Pleasant Work for Busy Fingers' by Maggie Browne,published by Cassell and Company in London in 1896, which is an English version of 'Des Kindes Erste Beschaftigungsbuch'. The Squid (De inktvisch) first appears in 'De Kleine Papierwerkers', written by Elise Van Calcar and published by K H Schadd in Amsterdam in 1863. The Dragon appears in 'Die Frobelschen Beschaftigungen: Das Falten' by Marie Muller-Wunderlich, which was published by Friedrich Brandstetter in Leipzig in 1900. It is very similar to the Squid. 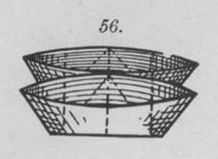 The Cup and Saucer (De kop en schotel) first appears in 'De Kleine Papierwerkers', written by Elise Van Calcar and published by K H Schadd in Amsterdam in 1863. The Open Box appears as 'La grande boite' in a list of designs in the 'Manuel Pratique de Jardins D'Enfants de Friedrich Froebel, which was compiled by J F Jacobs and published in Brussells and Paris in 1859. 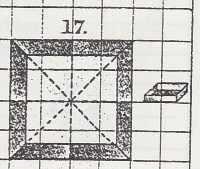 The design appears as 'The Large Box' in 'The Kindergarten Principle' by Mary J Lyschinska, which was published in London in 1880 by Wm Isbister Ltd. This design appears as 'The Large, Square Box' in part two of 'The Kindergarten Guide' by Maria Kraus Boelte and John Kraus, which was probably first published in 1882 by E. Steiger and Company in New York. The Open Box is pictured, but not named, in Eleonore Heerwart's 'Course in Paperfolding' was first published in Dutch in 1895 then in English by Charles and Dible in London and Glasgow in 1896. 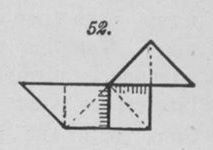 The Frame (Le cadre), which is made by flattening the Big Box, appears in a list of designs in the 'Manuel Pratique de Jardins D'Enfants de Friedrich Froebel, which was compiled by J F Jacobs and published in Brussells and Paris in 1859. ... and in 'The Kindergarten Guide' by Maria Kraus Boelte and John Kraus, which was probably first published in 1882 by E. Steiger and Company in New York. 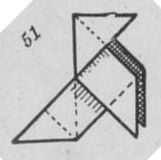 A design that, from the context, is probably the Frame is pictured, but not named, in Eleonore Heerwart's 'Course in Paperfolding' was first published in Dutch in 1895 then in English by Charles and Dible in London and Glasgow in 1896. The Frame also appears in 'Die Frobelschen Beschaftigungen: Das Falten' by Marie Muller-Wunderlich, which was published by Friedrich Brandstetter in Leipzig in 1900. 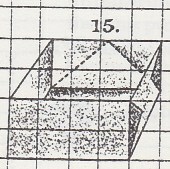 The Solid Box (La boite solide), which is an un-unfoldable design developed from the Big Box, appears in a list of designs in the 'Manuel Pratique de Jardins D'Enfants de Friedrich Froebel, which was compiled by J F Jacobs and published in Brussells and Paris in 1859. 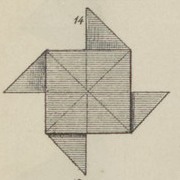 This design appears as 'A Firm Box' in 'The Kindergarten Principle' by Mary J Lyschinska, which was published in London in 1880 by Wm Isbister Ltd.
A design that, from the context, is probably the Solid Box is pictured, but not named, in Eleonore Heerwart's 'Course in Paperfolding' was first published in Dutch in 1895 then in English by Charles and Dible in London and Glasgow in 1896. The Mirror (Le miroir), which is made by folding two sides of the Picture Frame backwards, appears in a list of designs in the 'Manuel Pratique de Jardins D'Enfants de Friedrich Froebel, which was compiled by J F Jacobs and published in Brussells and Paris in 1859. This design appears as 'The Looking Glass' in 'The Kindergarten Principle' by Mary J Lyschinska, which was published in London in 1880 by Wm Isbister Ltd, but no illustration is given. This design also appears as 'The Looking Glass' in part two of 'The Kindergarten Guide' by Maria Kraus Boelte and John Kraus, which was probably first published in 1881 by E. Steiger and Company in New York. The Mirror also appears in 'Die Frobelschen Beschaftigungen: Das Falten' by Marie Muller-Wunderlich, which was published by Friedrich Brandstetter in Leipzig in 1900. The history of the Gondola and its close relative the Chinese Junk is recorded on a separate page.